Our hotel was very good – always great to stay in a pub, you only have to crawl upstairs after dinner, and it was splendid having breakfast overlooking the sea. We set off around 9.45am and made excellent time to Seaton. After Rachel’s knee problems yesterday, she was a bit concerned about whether she could walk today, but fortunately all was all. At Seaton, which is a tiny little cove, we stopped to paddle. It was gorgeous, the water was icey, but clear – turquoise on silver sand. We paddled around, cooling our feet, then had a proper ice cream. My first Cornish vanilla! We hadn’t eaten or drunk enough yesterday so were determined to make up for it today. The walk was a series of ups and downs, mostly steep, occasionally gentle. We reached Looe in very good time – a very pretty seaside town full of holiday makers. We stopped to collect a Cornish pasty for emergencies. Over the bridge, then a long climb back up to the tops of the cliff. Then down. Then up. And so on. About 4pm, we reached Polperro – another little gem. 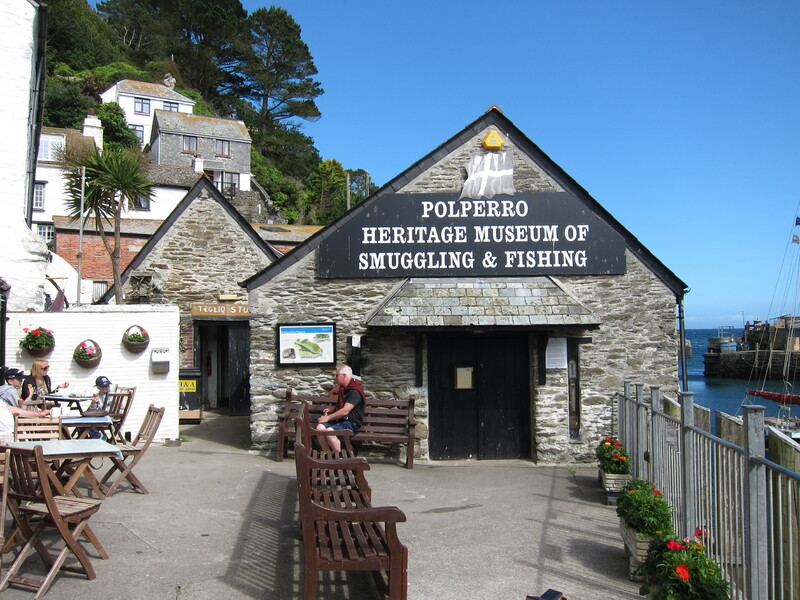 Polperro is a Village Trust and seemed to be thriving. We stopped for a really excellent cream, having spent part of the morning arguing over whether plain or fruit scones were best, and whether the jam or the cream should go on first (obviously, the jam goes on first!). The tea shop, next to the little museum, was able to cater for both our tastes. The sign post said Polruan 6.5 miles, which didn’t seem far, but it was a very long haul. More vertiginous ups and downs. We were rewarded by looking back and seeing how far we had come since yesterday and also, excitingly by a rare sight. We heard rustling in the undergrowth and first one, then a second, badger emerged and scuttled along the path – a rare sight indeed. 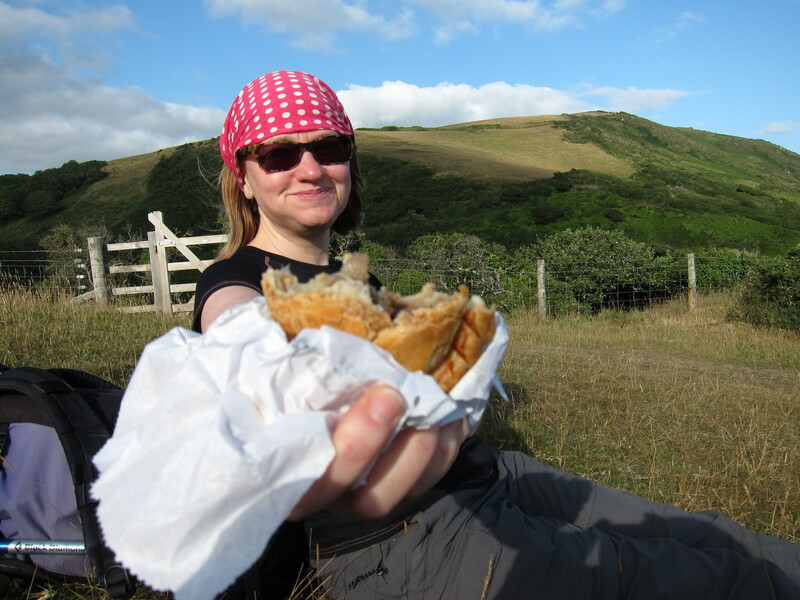 We then stopped for what Rachel christened her ‘pasty of happiness’. A very high quality pasty indeed. After that, the day seemed to drag a bit – the alleged 6.5 miles seemed like 10. At one point, the path split, but there was no indication of the route to take. The map clearly showed the left fork as the coast path, going round a headland, so we took that, but as we rounded it, the side fell away, and it was unclear which of several narrow tracks we should take, After an ascent that was not that pleasing, we finally reached a broader path, to discover barbed wire which had clearly been torn down by previous lost walkers. Unfortunately, I tripped on it and came down hard into a bramble patch. I am now sporting a bruised and cut leg, and hoping I won’t have a black eye tomorrow. As if physical injury were not enough, our ears were then assailed by the most appallingly loud music emanating from the beach below. Bad rap at what sounded like 120 decibels. We were starting to lose our senses of humour, not helped by a punishing staircase climb, then a steep drop and steep climb up. Looking up the second climb, I had been aware of movement for a considerable time, near the top of the hill. Rachel assured me it was not a herd of cows blocking the way, and it eventually resolved itself into two men. One, a young walker, apparently looking for a camp site, and the other an extremely weathered farmer, who looked, and sounded, like an extra from Poldark. We concluded he had been paid by the Cornish Tourist Board to add local colour. He talked and talked, and the Camper was looking increasingly harassed as he heard that Mr TrePol/Penn/Trelawney had never been away from Cornwall and couldn’t see any reason to do so. Camper was beginning to look as though he might never be able to leave either. We took advantage of a pause for breath to break free, leaving Camper to throw despairing glances after us. 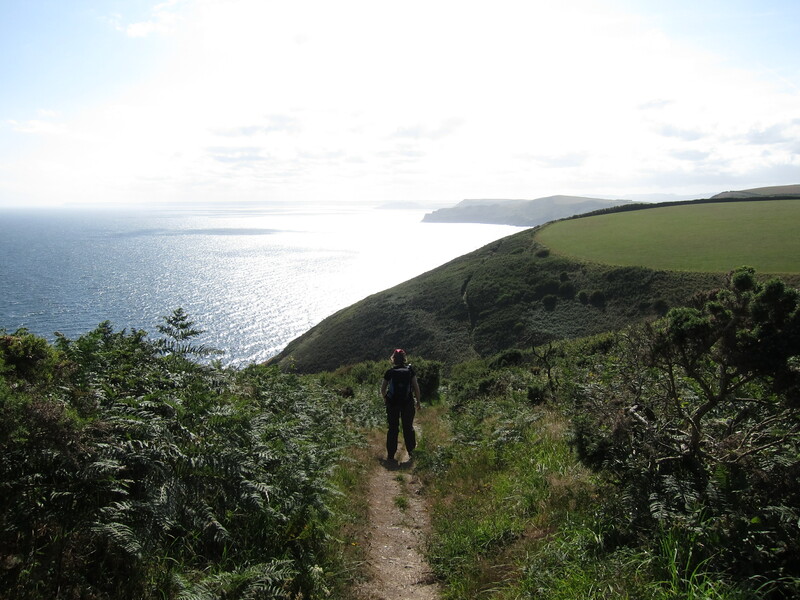 We then crossed several fields, before toiling with burning feet down a very steep road into Polruan, where we caught the ferry across to Fowey, and, filthy as we were, ate my birthday dinner in one of its nicest restaurants. 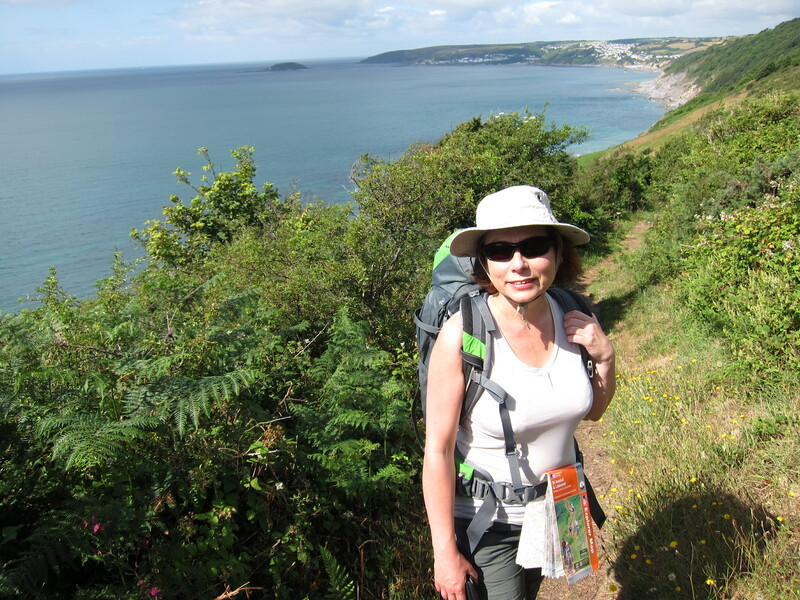 This entry was posted in Cornwall and tagged Fowey, Polperro. Bookmark the permalink.